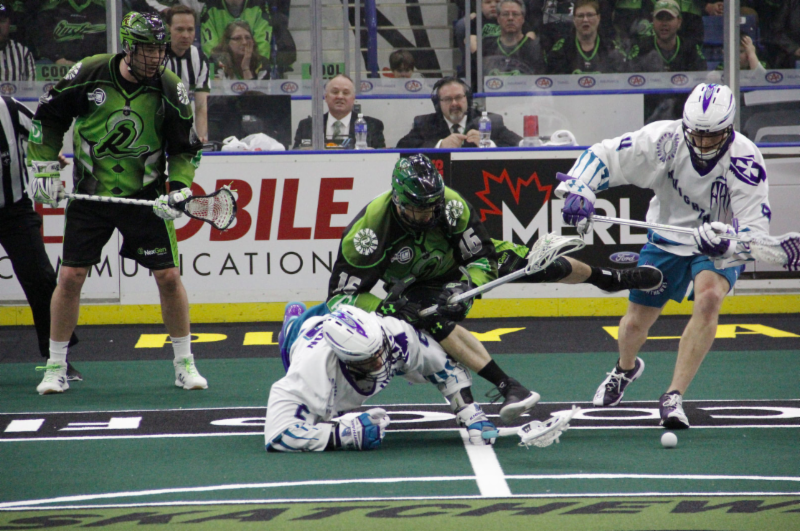 After falling by a single goal to the Calgary Roughnecks last week, the Rochester Knighthawks collectively bounced back to beat the Saskatchewan Rush 13-10 on Saturday night at Sasktel Centre. In a game where the powerhouse Rush mounted a massive comeback, it wasn’t enough as the Knighthawks hung on to sweep the season series 2-0. The Knighthawks have been a feel-good story for the NLL recently. Clawing back into conversation and climbing the standings in recent weeks have allowed them to earn a 7-7 record while sitting just a game back of first place in the east division. While the Rush have without question been the most dominant team this year, you can’t help but grin when looking at where the Knighthawks were at the beginning of the season, and where they are now. Though the Rush were celebrating “Superhero Night” nothing was super about the way this game started for them. The Knighthawks were able to jump out to an early three-goal thanks to Austin Shanks who assisted on Kyle Jackson’s goal and then scored a pair of his own, one of them shorthanded. The Rush did their best to narrow the gap before the quarter ended as two goals from the Rush’s Jeff Shattler and captain Chris Corbeil left them with a 4-2 deficit. The second quarter mimicked a game of chess as both teams exchanged timely goals throughout the frame. Each team tallied three times with Eric Fannell scoring twice to give the ‘Hawks a 7-5 lead at halftime. In the third, Fannell and Shanks both scored their hat-trick goals. The Rush responded with a lone goal from Robert Church making it 9-6. Rochester came out of the gate in the fourth quarter on fire with back-to-back goals, but the Rush pulled out the fire extinguisher and took over, scoring four in a row. Two came from Robert Church who completed his own hat-trick. They got close but were called for illegal substitution late in the game and Cory Vitarelli scored on the power play to end the streak. Shanks’ fifth closed out the game. The Rush dropping to 11-3 on the season is not a big deal. As they and Colorado are the sole members of the NLL to clinch a playoff spot, a loss here and there doesn’t hurt the brand as much as one would think. For the Knighthawks on the other hand, this was a statement game as they have been on the rise after trading long-time ‘Hawk Dan Dawson, who was held to a single assist in the game. With the Knighthawks sitting at 7-7 in a tight east division, they still have potential to make the playoffs. Joe Resetarits had a great game as he tallied seven points (2G/5A) which led the Knighthawks to a victory that speaks louder than words for a club on the rise. Cody Jamieson added five assists. Matt Vinc got the win, making 43 saves. The Knighthawks look to keep it rolling as they host the other top dog in the NLL’s western division when the Mammoth visit Blue Cross Arena next Saturday, March 31st, while the Rush are off until April 7th when they host the Mammoth as well.